New York: Bride's House, Inc, 1948. 1st. Decorative Cloth. Collectible; Very Good/Fine. A lovely copy of the 1948 1st edition. Clean and VG+ in its patterned boards, with very light wear at the edges. And including a Near Fine example of the publisher's glassine dustjacket. 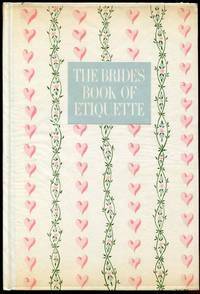 Quarto, 174 pgs.. Charming look into the late 40s world of wedding etiquette.